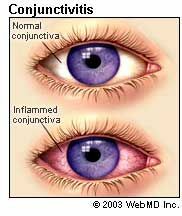 Conjunctivitis, also known as pinkeye, is an inflammation of the conjunctiva. The conjunctiva is the thin clear tissue that lies over the white part of the eye and lines the inside of the eyelid. Itchy, irritated, red, goopy eyes -- all signs of pinkeye. Usually one of two things is to blame: A virus or bacteria. Viral pinkeye: Red, irritated eyes. Watery discharge. May feel gritty. Lasts 3-5 days. Relieve itch and irritation with over-the-counter eyedrops. Bacterial pinkeye: Red, irritated eyes. Thick, yellow-green discharge. May be crusted closed when you wake up. You can treat it with antibotics. Both are really contagious. Wash your hands each time you touch your face. Children get it a lot. It can be highly contagious (it spreads rapidly in schools and day cares), but it’s rarely serious. It's very unlikely to damage your vision, especially if you find it and treat it quickly. When you take care to prevent its spread and do all the things your doctor recommends, pinkeye clears up with no long-term problems. Viral strains are the most common -- and may be the most contagious -- forms. They tend to start in one eye, where they cause lots of tears and a watery discharge. Within a few days, the other eye gets involved. You might feel a swollen lymph node in front of your ear or under your jawbone. Nonprescription "artificial tears," a type of eyedrops, may help ease itching and burning from the irritating things that cause your pinkeye. But you shouldn’t use other types of eyedrops because they may irritate the eyes, including those promoted to treat eye redness. Don’t use the same bottle of drops in an uninfected eye. It also helps to learn how to use eyedrops the right way. If your child has bacterial or viral pinkeye, keep them home from school or day care until they are no longer contagious. It's usually safe to return to school when symptoms are gone. But keep up the good hygiene! Mayo Clinic: "Pink eye (conjunctivitis)." Bradford, D (Editor) Basic Ophthalmology, American Academy of Ophthalmology, 2004. How Can I Prevent Pinkeye?